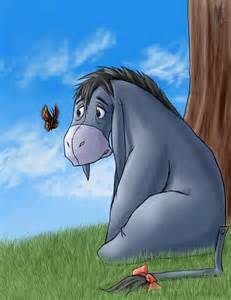 My husband is Eeyore in every way. He complains for everything. This past snow storm was no exception. First, was the eye popping, veins to the top of the skin reaction to “What if we lose power? How are we going to shovel the drive? How are we going to keep warm? What about the pipes? Two to three feet snow, this is ridiculous. We’ll get three with our luck.” I was exhausted even before the storm hit. Then we slept and woke up to beauty. My husband stomped around irritated. My poor dog always shakes when he stomps around in his boots. I calmly got breakfast and then slipped into my snow gear. Outside was magical. I started shoveling. He came out and cursed at the snowblower. It started and he began to clear the driveway, then the yard. He either doesn’t like snow, or he loves using his snowblower. Our front yard is cleared of snow now. Charlie comes over to me to complain that I am making more work for him, the way that I am shoveling. I dusted myself off and went inside. Ah warmth. I made lunch. He comes inside mad that I am mad at him. “I’m not mad at you.” I say. He stomps away. His complaints are draining and don’t get me started on his long SIGHS. That is another post.